A classic and timeless choice with impressive versatility, one of our most popular offerings is wooden baluster design. This week, we discuss the basics – what options are available for customers seeking wooden handrail systems? Our creative team provides innovative and comprehensive design services, and we work to ensure on-time delivery and complete client satisfaction in every project. 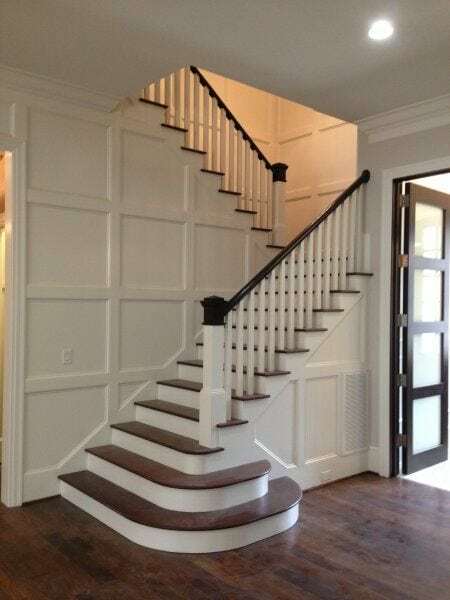 Are you considering wooden balusters for your upcoming staircase project? 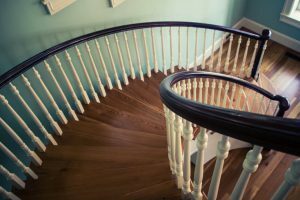 Below we outline some key considerations in the wooden baluster design process. 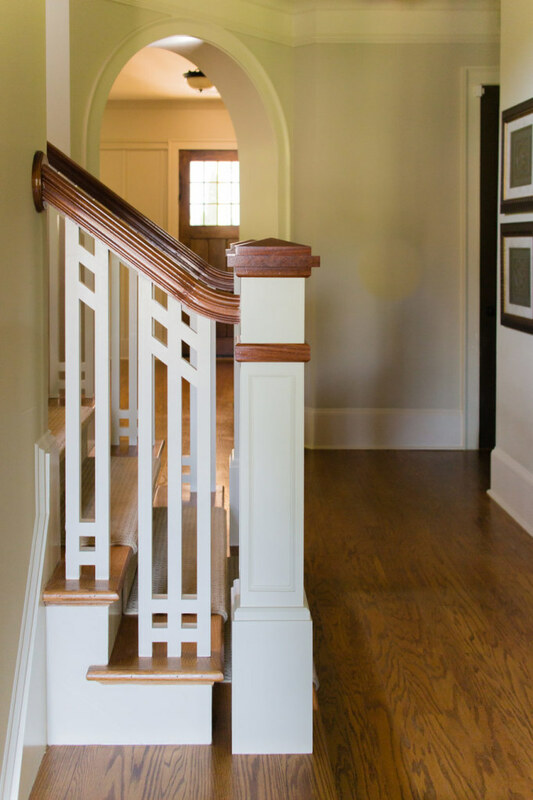 Whether a customer selects a wooden baluster design from our vast stock portfolio or enlists our team of craftsmen to design and construct one-of-a-kind custom wooden balusters, there are endless styles available. 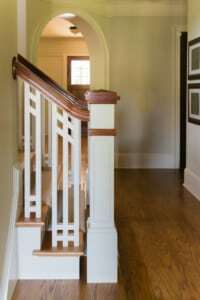 Below, a unique custom wooden baluster system includes plain, square balusters interspersed with starburst panels for a whimsical take on craftsman style. 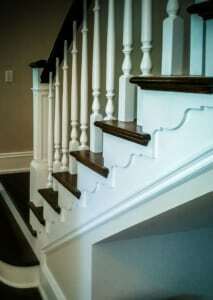 Below, another custom wooden baluster design incorporates geometric patterns for a unique and eye-catching aesthetic. For customers interested in selecting wooden baluster designs from our stock offering, we are proud to offer a wide array of options. Below, see several of our popular offerings. Next, the Hampton is another eye-catching classic profile. 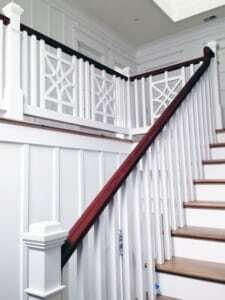 Hampton balusters match the Regency in size while lending a slightly different aesthetic. Customers seeking a less traditional, more streamlined wooden baluster design may want to consider our square balusters. Clean lines and a minimalist, no-fuss construction set this option apart. 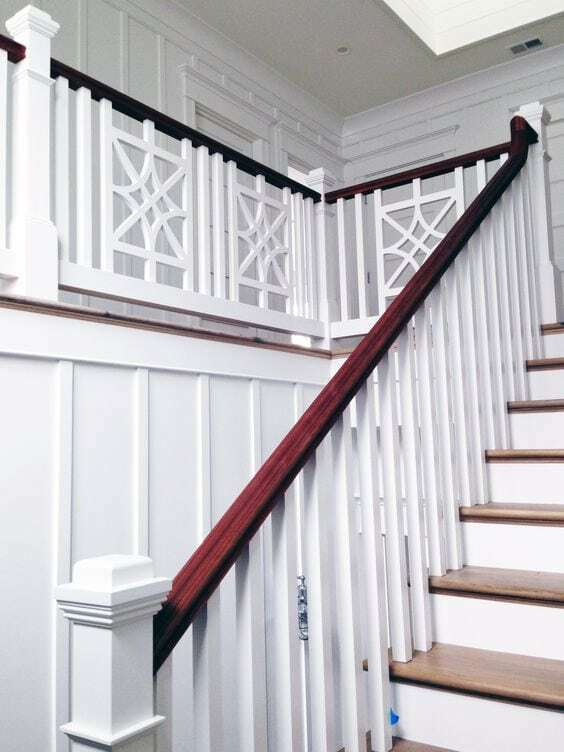 Like the square balusters, our panel baluster selections offer clean lines and a crisp look. The Hyannis Rake Camden baluster system below is a perfect fit for this craftsman home. The next key consideration in the wooden baluster design process is milling. 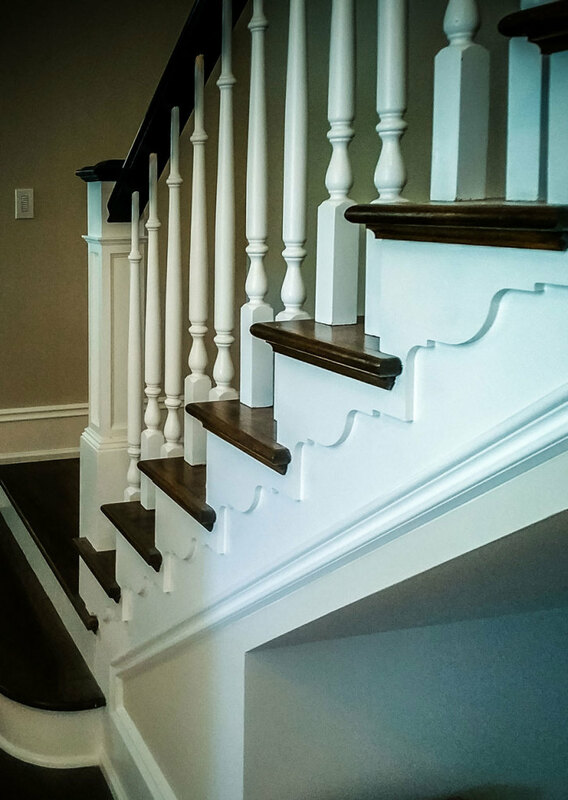 A unique milling process can transform a baluster profile, adding a special touch to best fit the style of the space. Our team offers various milling options including fluting, reeding, twisting, and carving. The image below shows our Charleston style balusters and newels finished with plain, fluted, and twisted milling (from left to right). 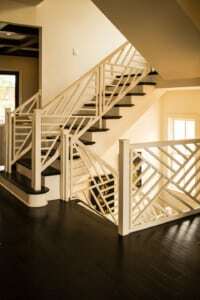 Following the wooden baluster design phase, the stair and handrail system are constructed within our facility. To prevent fit issues and other challenges that may lead to project delays, we pre-fit each handrail system to its staircase before delivery and installation. The system is then delivered and installed at the job site. 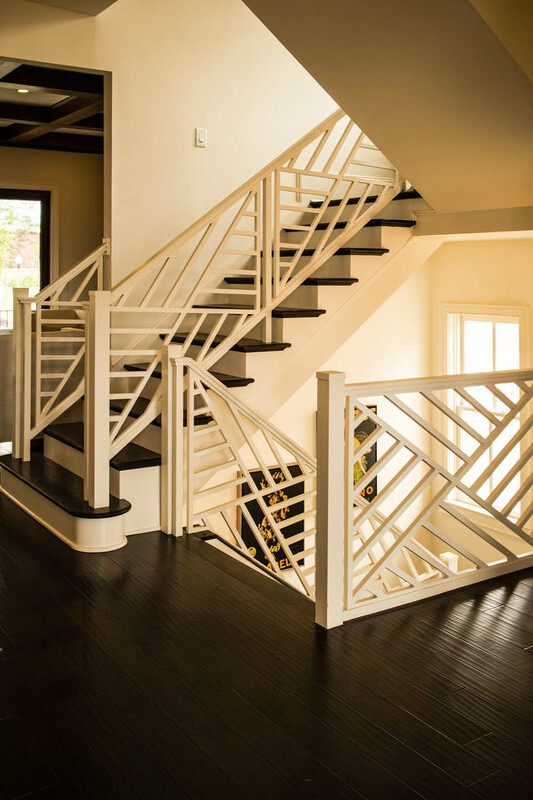 Whether traditional or modern, stock or custom, our team designs and builds the highest quality wood handrails, and we follow a turn-key approach to ensure smooth processes through all phases of construction. From inspiration to installation, we are dedicated to customer satisfaction. 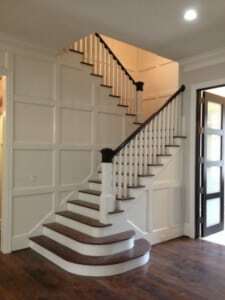 Contact us to discuss your upcoming wooden baluster design project.